PFAS contamination on military installations is widespread because for nearly 50 years, the Department of Defense, or DOD, has used firefighting foam – so-called aqueous film-forming foam, or AFFF – that contains PFAS chemicals. Studies link PFAS exposure to kidney and testicular cancer, thyroid disease and weakened childhood immunity, among an array of serious health problems. PFAS chemicals bioaccumulate in human tissue and blood and can stay there for years. 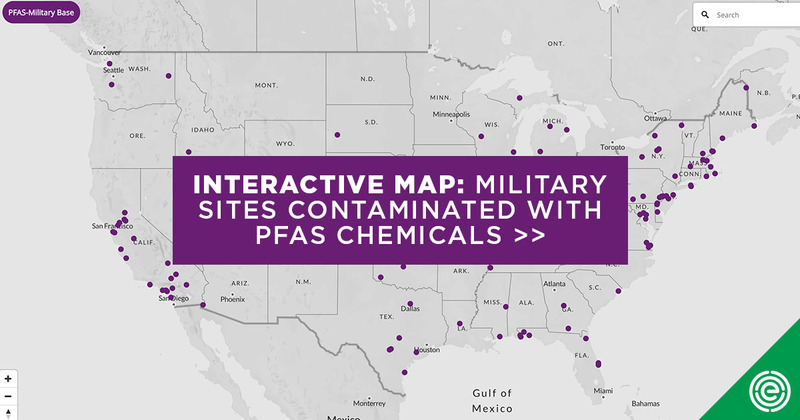 The interactive map below shows sites of PFAS contamination identified through DOD reports analyzed by EWG. Clicking on a dot brings up details about tests of drinking water or groundwater and the levels of PFAS detected. Last year, the Pentagon said there were 401 installations where there are known or suspected releases of the two best known PFAS chemicals, PFOS and PFOA, into groundwater. But the information released then was incomplete and imprecise. EWG has submitted a Freedom of Information Act request for more details but has not yet received a complete response. In addition, as of 2014, there were 664 current or former military fire- or crash-training sites, all of which are likely contaminated with PFAS chemicals. It is unclear how many of those sites were included in the Pentagon count last year. Also, as a number of states continue testing for PFAS contamination, it is possible that more military sites will be identified. This strong bond makes PFAS chemicals heat resistant. They can also form a film on the surface of petroleum, making them particular effective at suppressing and extinguishing high-heat petroleum-based fires. 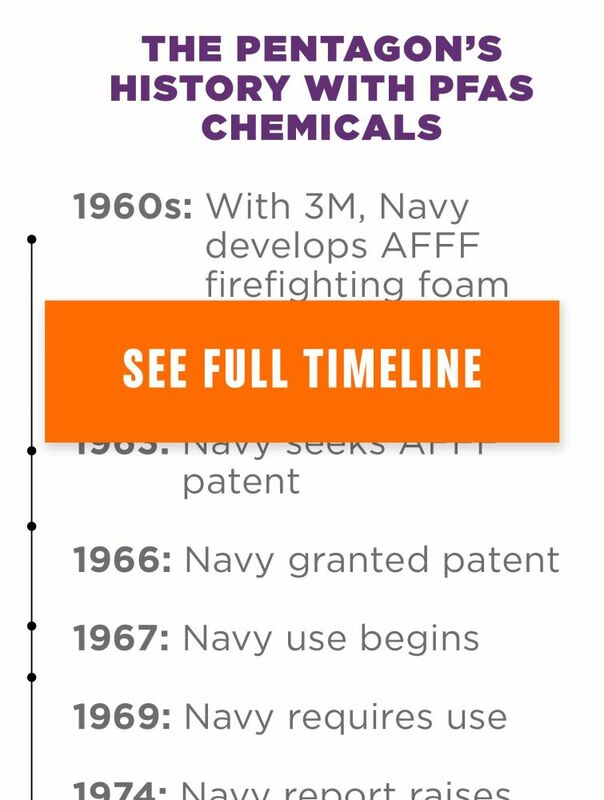 In the early 1960s, the Navy worked with 3M to develop firefighting foams containing a combination of PFAS chemicals. In 1969, the military adopted specifications requiring the use of these AFFF foams for fire training and emergencies. In addition to fire emergencies, the military has historically used AFFF for training exercises and equipment testing that have also resulted in the discharge of large volumes of AFFF. These discharges can create PFAS contamination in groundwater that may be used as drinking water, in soils and sediments, and even in food. From there the chemicals get into the bodies of people and animals. Last year, high levels of PFOS in fish and deer near the decommissioned Wurtsmith Air Force Base in Michigan prompted officials to advise against eating them. Despite concerns voiced by both 3M and Navy scientists as early as the 1970s, the military has continued to require the use of AFFF containing PFAS for nearly 50 years. In 2000, the military learned from an EPA official that 3M had decided to stop the production of PFOS, the primary PFAS chemical in firefighting foams. In 2001, an internal memo indicated that DOD knew PFOS was “persistent, bioaccumulating, and toxic.” But the department waited another decade to issue a “risk alert” with guidelines to reduce future releases and another four years beyond that to begin to phase out the use of AFFF produced with PFOA and PFOS. According to reporting by Sharon Lerner of The Intercept, the phaseout began in 2015. The Air Force completed the transition in 2018. The Army is not scheduled to replace AFFF with PFOA and PFOS until this year, and the Navy is not scheduled to replace the old formulations until 2020. That will not eliminate health concerns, because studies of the replacement PFAS chemicals that remain in AFFF show that they present many of the same health concerns. There are more than 4,000 PFAS chemicals, although the EPA estimates that only 602 are actively used in commerce. Fluorine-free foam is also used at several international airports, including London Heathrow and all major airports in Australia, Copenhagen and Dubai. During a fire emergency at Heathrow in 2013, fluorine-free foam was used to extinguish the fire in less than three minutes, and all 80 passengers were evacuated safely. DOD is researching AFFF alternatives but has so far reported that “no commercially available PFAS-free foam has met DOD’s performance requirements.” However, the department has taken no steps to change its performance requirements. The primary law governing the cleanup of contaminated sites is the Comprehensive Environmental Response, Compensation, and Liability Act, better known as Superfund. The Superfund Amendments and Reauthorization Act of 1986 clarified that federal facilities, like active and decommissioned military facilities, are subject to the cleanup requirements in the Superfund law. The amendments also established the Defense Environmental Restoration Program to address pollution at both active and decommissioned military facilities. Superfund primarily facilitates the cleanup of pollution from chemicals that have been designated as hazardous substances. However, Superfund also requires action when there is a release or substantial threat of release of any “pollutant or contaminant which may present an imminent and substantial danger to the public health or welfare.” PFAS chemicals are considered “pollutants or contaminants,” but they are not yet considered hazardous substances under Superfund. The EPA is considering this designation, and bipartisan bills have been introduced in the House and Senate. Once PFAS chemicals have been designated as hazardous substances, the EPA will have the power to clean up contaminated military installations, order polluters to clean up contaminated sites, and recover cleanup costs from polluters. The hazardous substances designation also triggers reporting requirements for releases of those substances. Under Superfund, cleanup can take the form of short-term removal in response to imminent danger, or longer-term remedial actions designed to permanently address the risks from the contamination. Although some removal actions are relatively quick – sometimes as short as weeks – remedial actions can take years or decades to complete and usually cost millions of dollars. Remedial actions are reserved for sites that have been placed on EPA’s priority list of contaminated sites, called the National Priorities List. The EPA reported in June 2018 that it was engaged in PFAS-related activities at 58 federal facility National Priorities List sites. But the EPA suspects that there is PFAS contamination at many of the 140 Defense Department facilities on the list. Since the military has identified 401 sites with known or suspected releases of PFAS chemicals, this list is likely to grow. Superfund is a “strict liability” statute, meaning that a responsible party, like the military, can be held liable even if it did not act negligently. This liability is not limited to damages within the boundaries of the facility but can extend to wherever a hazardous substance has migrated. Because some kinds of PFAS chemicals, particularly the new-generation PFAS chemicals that have replaced PFOA and PFOS, are known to migrate, this could expand the extent of liability for the military at some Superfund sites. There are some differences between the cleanup procedures at federal and non-federal facilities under Superfund. Non-federal sites can be cleaned up through a special government fund called the Superfund Trust Fund. But cleanup at federal facilities like military installations must be done with funds appropriated to the liable agency. Likewise, states are obligated to pay part of the cost of cleaning up non-federal sites that are financed through the Superfund Trust Fund. Because federal facilities must use appropriated funds for cleanup, states are not required to share the cost of cleaning up of federal facilities. How and to what degree a specific contaminant like PFAS at an individual Superfund site must be cleaned up is not specified by the law. Instead, specific cleanup requirements are determined on a site-by-site basis. In general, the law requires “applicable, relevant, and appropriate requirements” to protect human health and the environment. These can be state or federal requirements or other criteria. But remedial actions are required to meet the same goals as the federal drinking water and clean water laws. There are no federally enforceable standards for PFAS chemicals. In May 2016, the EPA issued a lifetime health advisory for PFOA and PFOS in drinking water of 70 parts per trillion, or ppt, either individually or in combination. But this guideline is not a legally enforceable limit, so polluters are not required to take cleanup actions that meet the guideline under Superfund. What’s more, many public health and environmental experts believe the EPA’s guideline is not sufficiently protective of public health. In 2016, Philippe Grandjean of the Harvard T.H. Chan School of Public Health and Richard Clapp of the University of Massachusetts at Lowell calculated that an approximate safe dose of PFOA and/or PFOS in drinking water would be 1 ppt. Nonetheless, in a June 2018 report to Congress, the Pentagon recommended an astounding groundwater cleanup level of 380 ppt. Federal facilities that are not on the National Priority List are also required to comply with any state laws requiring removal and remedial action, so long as those requirements are not more stringent than those applied to non-federal actors. Since the Pentagon has identified 401 sites with known or suspected PFAS releases, but there are only 140 DOD sites on the National Priority List, there could potentially be many federal facility Superfund sites subject to remediation levels set by states. Indeed, both the Navy and Army have acknowledged that state-promulgated PFAS standards “will likely be considered” applicable under Superfund. Bipartisan legislation introduced in the House and Senate last year would require cooperative agreements between states and these federal facilities to expedite cleanups. This is significant because states have been very active in proposing and setting PFAS standards. In 2018, New Jersey set a drinking water standard – a Maximum Contaminant Level, or MCL – of 13 ppt for another PFAS chemical, PFNA. New Jersey has also accepted, but not finalized, recommended MCLs of 14 ppt for PFOA and 13 ppt for PFOS. In January, New Jersey proposed interim groundwater cleanup values of 10 ppt for PFOA and PFOS. Additional MCLs for PFAS chemicals have been proposed in New York and New Hampshire. Alaska, Michigan, New Hampshire, New Jersey, New York, Vermont and Washington state will also consider additional drinking water limits this year. Drinking water standards set by these states could impact the cleanup standards for the Defense Department, significantly influencing the cost and scope of cleanup at military sites that are not on the National Priority List. Despite the scope of likely contamination and the threat posed to service members and their families, military officials are pushing back against attempts to force the Defense Department to pay for cleanup of contaminated bases, or even monitor the health of military families and neighbors. This year, the Air Force told Michigan it did not have to follow state regulations limiting to 12 ppt the amount of PFAS chemicals that can enter surface water. Tests in Michigan near the former Wurtsmith Air Force base have found PFOS in groundwater at levels as high as 42,000 ppt. City officials in Dayton, Ohio, have also found the response from the Air Force to cleanup contamination at Wright Patterson Air Force Base to be inadequate. The Navy is also fighting a lawsuit in Pennsylvania that would require it to pay for medical monitoring of families that were exposed to high levels of PFAS chemicals near Naval Air Station Joint Reserve Base Willow Grove and/or the Naval Air Warfare Center Warminster. The military is also fighting lawsuits related to AFFF contamination in Newburgh, N.Y., New Mexico, and Washington state. Instead of fighting efforts to clean up contaminated installations, the Pentagon should be leading efforts to protect military families. Last month, EPA proposed a PFAS action plan that delays action on a hazardous substance designation under Superfund or the development of drinking water standards under the Safe Drinking Water Act. The EPA plan would not end the use of foams or other products made with PFAS chemicals and would not expand efforts to monitor for PFAS in water. Stop adding more PFAS chemicals to the environment. PFAS should be banned from firefighting foam, especially that used in military training exercises. In addition, PFAS should be banned from consumer products, including cookware, food packaging, cosmetics, carpeting and clothing. Stop approving new PFAS chemicals. More than 4,000 PFAS chemicals exist, so there’s no reason for the EPA or the Food and Drug Administration to let any more on the market. Find out where PFAS chemicals already are. Requiring military bases, water utilities and regulators to monitor for PFAS in water, air and food, and improving the tools to measure contamination, would tell us the extent of the PFAS contamination crisis. Agencies like the EPA, the Defense Department and the Centers for Disease Control should also conduct body burden testing, medical monitoring and health impact studies of people affected by PFAS contamination, especially military families. Find out where they’re coming from. Adding PFAS chemicals to the Toxic Release Inventory would disclose who is releasing them into our water, soil and air. Polluters and the Defense Department should also be required to warn neighboring communities of their potential exposure. Add PFAS to the Superfund cleanup law. Classifying PFAS as a hazardous substance under the Superfund law will help communities begin to clean up contaminated sites, including contaminated military installations. The EPA should also make sure PFAS chemicals are properly disposed of. Set an enforceable limit for PFAS in tap water. More than 1,500 drinking water systems serving about 110 million Americans may be contaminated with PFAS chemicals. Setting an MCL will require utilities to treat tap water to remove or lower PFAS contamination. Make polluters pay their fair share. Many of the companies who manufactured or used PFAS knew the risks to human health but failed to protect workers or nearby residents or notify the EPA, Defense Department or state and local regulators. Adding PFAS to Superfund will ensure that polluters pay. Polluters should also be responsible for taking back and safely disposing of their PFAS products, like firefighting foams. Other measures, such as a cleanup trust fund, should also be created, and Americans impacted by PFAS pollution should be allowed to take action through the court. Since the EPA and the Defense Department have dragged their feet for decades, state action is essential. Banning PFAS in food packaging: At least eight states will consider policies to eliminate or reduce PFAS in food packaging. States considering bans include Connecticut, Massachusetts, Maine, Minnesota, New Jersey, New York, Rhode Island and Vermont. Banning PFAS in firefighting foam: At least nine states will consider policies to ban the use of PFAS in firefighting foam. Washington state passed a ban on PFAS in foam last year, and the Federal Aviation Administration has been directed to rewrite regulations to allow for PFAS-free foams at airports. States considering bans are Alaska, Connecticut, Michigan, Minnesota, New Hampshire, New York, Rhode Island, Virginia and Vermont. Addressing PFAS in drinking water: Beyond regulating PFAS in firefighting foam, at least seven states will consider policies to limit levels of PFAS in drinking water, as well as fund cleanup of contaminated drinking water, including medical monitoring and testing. States considering actions include Alaska, Minnesota, New Hampshire, New Jersey, New York, Vermont and Washington. 1 EWG was able to map 106 test sites documented in the “Addressing Perfluorooctane Sulfonate (PFOS) and Perfluorooctanoic Acid (PFOA)” PowerPoint by Maureen Sullivan, Deputy Assistant Secretary of Defense, March 2018.